Preheat the oven. Place a layer of lasagne sheets in an oven dish, followed by a layer of butternut and then the spinach mixed with mascarpone cheese. Repeat the process. 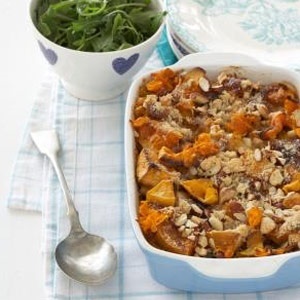 Sprinkle cinnamon and/or nutmeg over the layer of butternut. Finish each layer off with some caramelised onion or onion marmalade. Sprinkle nuts and Parmesan over the top. Bake for about 25 minutes until golden brown.